Patrick Fleury is a new member of the WIT family, but has fully drank the Kool-Aid. 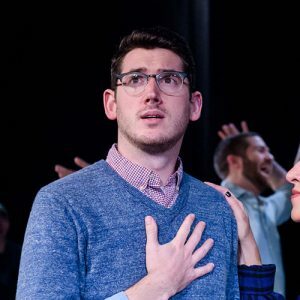 Starting in 2015, Patrick trained at the Upright Citizens Brigade in New York, completing their Improv 101-401 course as well as participating in their advanced study program. He moved back to the DC area in September of 2017 and has dove headfirst into WIT’s community. You can find Patrick performing with WIT production Improv Actually or WIT ensemble iMusical. Patrick is also the coach of WIT’s Harold team, Lizard Girl. Patrick loves every single podcast and is almost certainly drinking a Pampelmousse LaCroix right now.